I barely had to seek an image for this month’s Aquarius Moonwalk; this one found me. The dramatic combination of moon, lightning and especially the monolith reminded me of the movie 2001: A Space Odyssey . I was in my early 20s when “2001” came out. I needed to read the book to have a clue what that mysterious monolith meant. Recognized by many critics as one of the greatest movies ever made, “2001” vibrates with Aquarian themes: human evolution, artificial intelligence, and technology. To punctuate why it might have reminded me even further of New Moon in Aquarius, the main-character astronauts were traveling to the Moon. Stanley Kubrick’s dramatic movie is a journey of man’s consciousness. According to famous Chicago movie reviewer, Roger Ebert, the Star Child at the end of the film symbolizes man’s ultimate passage into a new level of consciousness. What could be more Aquarian—or Age of Aquarius? 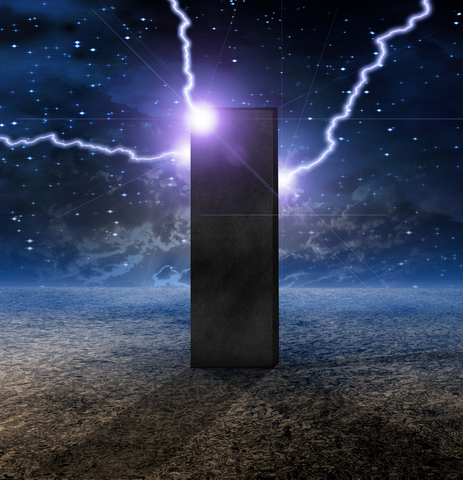 Strange things happened whenever and wherever the monolith appeared—and in every era of history. People changed. The monolith seemed to be a catalyst—yet highly unusual and inexplicable. (Are any of you natal Aquarius Moons getting misty to hear someone finally “get” you?) As far as I’m concerned, we could almost call it Moon in Monolith. Perhaps as a kid, you visited Disneyland and one of its main attractions, Tomorrowland. That’s where Aquarius Moon lives. She is a monolith throbbing signals of evolution and living to feel the thrill of those kinds of high-pitched impulses. According to the Disney website, Tomorrowland represents the vision and fantasy of futurists such as H.G. Wells, Jules Verne and, of course, Walt Disney. Guests can zoom through Space Mountain, experience 3-D fun in "Captain EO", travel through the galaxy in Star Tours, drive race cars and enjoy so much more as they experience the “future”. Aquarius Moon does this sort of thing when she comes out to play. If you live with a strong Uranus or planets in Aquarius, you probably relate to the children’s song, “I’m a lonely little petunia in an onion patch.” I hope you still don’t cry all day, but this lunar energy can indeed feel lonely, isolated, and isolating. The space man on his mission in “2001” talks to a computer as his companion. It’s so Aquarius Moon. ==> Meditate on what makes you different—and learn to love it. If it’s hard to be objective about yourself, ask your friends what makes you unique. How can you turn your “oddity” into an asset? Some of their answers may surprise you, because they may already see those unusual characteristics as your unique talents or contributions. Vow to see your differences from appreciate eyes. Watch how it changes everything. Write about it. ==> Create a safe place for your mind to run wild this month and let your craziest ideas and fantasies come out of the closet. Even if it’s only in the safety of your journal, let the sky be the limit on brainstorming. No matter how impractical, write it down. Share at some point with a trusted friend or friends to learn which of your crazy ideas might just be strokes of genius, waiting for someone’s input or the incubation of your next idea on how to turn them into practical realities. ==> Observe how you, like the “2001” monolith, by your mere presence evoke changes. Another way to do this—and another movie reference—is to imagine yourself the star of It’s A Wonderful Life . Open a document on your computer, start with your birth, and imagine how your family would have been different if you weren’t born. Write about it. Continue with school, work, and community. If you’re not surprised, I will be! ==> Do something far-out, however you define it. This New Moon isn’t for the feint of heart, especially with that big line-up in Aquarius. If you’ve always wanted to try your shtick on open mic night at the local comedy club, this is the time. Bungie jumping, anyone? (Double-check all the safety gismos and routines. This is, after all, an energy ruled by erratic Uranus.) Afraid to speak up on a cause you care about? Make that placard and walk that picket line. Sign that petition. Take a stand on your blog. ==> Nurture through freedom. That includes nurturing your freedom to be the one and only you. Let up on the kids’ or grandkids’ curfew and tell them you trust their judgment. See for yourself how responsibly they handle freedom with just a little faith in them. Celebrate yourself and the other “unicorns” you know. Find ways you can spend more time in their heady and open-minded company. If a group doesn’t exist that creates community of people who think along the same lines, whether it’s astrology, your spiritual viewpoint, or some activity that you really love, create it. That’s what MeetUp is for … and all the social networking tools. ==> Rent 2001: A Space Odyssey. Watch it and write about it in your journal. Google some of the major critical reviews of it. They are awesome! After the way it took over this month’s Moonwalk, it’s now #1 in my Netflix queue. High-Octane Stellium. 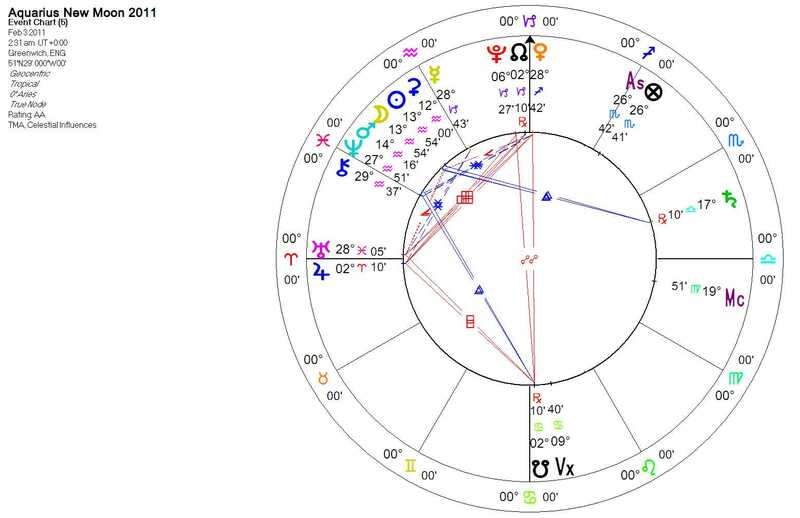 The chart of this New Moon is almost as an exciting as that “2001” trip to outer space. If Uranus is the Awakener, this month is a six-shot cappuccino with six planets pulsing in Aquarius, domain of the Big U. That’s one huge cup of “leaded.” If your awareness isn’t heightened and your consciousness catapulted over the next 28 days, have someone take you to the nearest emergency room. You might be in a coma! Into the Mythic: Let’s Get Ceres. I have recently turned on Ceres as a point in my Solar Fire software because of its significance in my own chart. There’s another reason. Pluto has been demoted to a dwarf planet and Ceres has been promoted from an asteroid to the same class of planetary objects. They are not only related by type as dwarf planets in the most recent changes to the astronomical classification system; they are related by mythology. At any rate, Pluto is gaga over the P-girl and abducts her into Hades, leaving her mother Ceres in such grief; Ceres avenges the dastardly deed by cutting off all growth on the planet. Starvation has a lot of leveraging power. Demeter/Ceres demands her daughter back and is able to cut a deal to bring Proserpina/ Persephone home for half the year. As you can see, Ceres the dwarf planet joins the Sun/Moon/Mars conjunction, and it is a powerhouse alignment. As Pat Paquette on Realastrologers notes in Serious about Ceres, Ceres was the only god or goddess in mythology that went up against Pluto and won, even if the prize was only a compromise. This powerful Ceres/Sun/Moon/Mars in fixed Aquarius suggests the sudden meeting of immovable objects and irresistible forces, to quote the Lyrics of Something’s Gotta Give. Ceres in the mix suggests to us that we must hold our ground for a solution that meets everyone’s needs at least part of the time. With Chiron sextile Venus on the far end of the stellium in Aquarius, the forces, indeed, may involve love, as Sammy Davis sings about so eloquently. Heal an impasse with your honey, just in time for Valentine’s Day. One more thing about Ceres brought to light by Alison Chester-Lambert in The Future in the Stars: The Astrological Message in the Stars for 2012 and Beyond. Ceres is connected with losses that are made right to some degree. Persephone comes back, even if only half time. If Aquarius devotes itself to group good while celebrating our freedom to be you and me, what has seemed lost in your world and ours that might be somehow reclaimed this month? At least in part? Health care reform in the U.S. comes to mind as Republicans begin their “repeal and replace” strategy. Will the two parties find a solution that pleases all of the people some of the time? For yourself, think about what stubbornly stuck situation you might move at least halfway to resolution. Back on Earth. I love Saturn trine Ceres/Sun/Moon/Mars in this New Moon chart, because it provides the grounding those multiple planets in Aquarius desperately need to keep from going airy-fairy instead of being down to earth and applying genius to practical problem solving. Mercury’s sextile to Uranus makes the atmosphere very inspiration friendly. If there’s a puzzle you need to unravel, energy you need to shift, or creative approaches you need to find, do that second bullet, above, on journaling this month for sure. As we know with sextiles, they can be very fortunate, but they require us to “work it.” This reminds me of folks who think you can sit around with your feet up, repeating affirmations, without the God Helps Those Who Help Themselves part. Engage. Parting of Ways. Uranus and Jupiter are finally separating. Say good-bye to the conjunction that has wired and tired many of us in the tight tango these two planets have been dancing together since last year. How did this conjunction play in your life? If you’re like me, you’re too busy living it to notice as much during a transit as you do in retrospect. Later, you can quietly contemplate what was that? The Jupiter/Uranus conjunction exaggerated (Jupiter) everything astrological (Uranus) for me and, took me places I never even knew I wanted to go. This is mostly good—I think! Jupiter expands us, Uranus awakens us … and if you need help deciphering what just hit you, it would be a great time to read Anne Whitaker’s book, Jupiter Meets Uranus or read her blog of the same name. As Uranus moves into Aries on Mar. 11-12, depending on your place on the globe, consider the impacts on innovation both personal and planetary. Futuristic, insight-flashing Uranus enters the sign of the pioneer and joins that Martian energy to do it now. Life, no doubt, will be full of surprises. Who knows what’s next? I hope you’ve enjoyed this month’s multi-media, monolithic view of Moon in Aquarius and February’s New Moon cycle. Same time, same place—different Moon—next month. Are you a New Moongram reader? This month’s special, available only to people on the New Moongram newsletter mailing list, is $25 off an Astro-Tarot reading with Joyce. Her normal $100 fee is $75 through March 3. To join the mailing list, click on the icon in the upper right of the sidebar. Love it! I think all hugs sent via computer are a bit Moon in Aquarius. I've got Saturn/SN at 6' Aq here, so I'll keep my eyes open. Interesting about the moon, though. I have a Virgo Moon, conj Uranus and Pluto (and Sun), and when I read Moon descriptions, the Aquarius makes a lot more sense to my life than that Virgo Moon ever did. 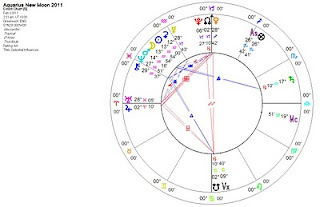 Natalie, with Uranus/Pluto and Sun conjunct your Moon in Virgo, it makes sense that you would feel more like an Aquarius Moon because of the Uranian influence. In fact, think of your Moon as conjunct the '60s counterculture movement. The Uranus/Pluto conjunction rocked the world at that time ... and know that your feeling life bears its signature. By the way, that signature also makes you a very Radical Virgo. It's always good to get your input, and I thank you for sharing your comments on a regular basis. I don't have my moon in Aquarius but both my Mars and my Venus are there so I definitely feel some pull from them! I had a very close friend and a special boyfriend who were Aquarians and I used to tell them I could see their little "invisible" antennas going up and down from their head like Martin on My Favorite Martian, lol. Maybe that's because I had a small set of my own. I loved Tomorrowland - it was my favorite place in Disneyland - especially that great House of the Future from Monsanto, back in the 60s it showed video phones! I'd still like to live in that house! Be A Hero: The Radical Virgo Wants YOU!